It is very likely that you will say “Yes!”, because nearly one in three people either have a food allergy themselves, or a member in the family who is allergic to certain foods. Food allergies should not be confused with food intolerances. A food allergy is a condition in which the immune system reacts to certain foods in the same way that it reacts to bacteria and viruses, namely by producing antibodies. Food allergies can be immediate and life threatening, as in the case of someone who eats a strawberry and can’t breathe. Or they can be delayed and much less severe but nevertheless cause significant problems. The vast majority of people who have food allergies, many of whom don’t know it, have the delayed type of reaction. A food intolerance does not involve the immune system, but is a condition where the body has a hard time digesting certain foods. For example, being allergic to milk is different from not being able to digest it properly due to lactose intolerance. It is extremely important for people who have true food allergies to identify them and prevent allergic reactions to food, because these reactions can cause devastating illness and, in some cases, death. Food allergies are caused by allergens (the food fragments responsible for an allergic reaction) which are proteins within the food that usually are not broken down by the heat of cooking or by stomach acids or enzymes that digest food. As a result, they survive to cross the gastrointestinal lining, enter the bloodstream and go to target organs, causing allergic reactions throughout the body. Which Food Allergies Are Most Common? In children, the food allergy pattern is somewhat different. The most common food allergens that cause problems in children are eggs, milk, and peanuts. Adults usually do not lose their allergies, but children can sometimes outgrow them. Children are more likely to outgrow allergies to milk, eggs, or soy than allergies to peanuts, fish, or shrimp. Gluten intolerance is associated with the disease called gluten-sensitive enteropathy or celiac disease. It is caused by an abnormal immune response to gluten, which is a component of wheat and some other grains. In some cases, however, onset of symptoms may be delayed for hours. Symptoms of allergies vary from person to person. The amount of food needed to trigger a reaction also varies from person to person. While you should consult a doctor in the case of severe food allergies, many of the home remedies for food allergies can be effective and easy to use for millions of people. If you don’t want to deal with pharmaceutical side effects of other treatment options, then try some of these options below to improve the quality of your life. 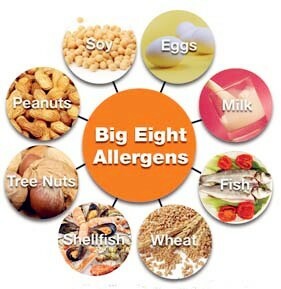 The best method of treating food allergies is to avoid consuming the allergenic food all together. There are a number of elimination diets that can work, but it is important not to make mistakes, especially if you aren’t sure what is causing you to have a negative reaction. Record what you eat for 2-4 weeks, detailing every meal, along with recording any reactions that you might experience along the way. Then, slowly begin removing certain foods (1 at a time) from your diet for 1-2 weeks at a time and monitor any change in reactions by your body. At that point, if you do suspect that removing a food from your diet caused the improvement, then you should double check your suspicion and add it to your diet (two times per day). Once the symptoms come back, then you can safely confirm that these are your trigger foods. Do this repeatedly until you have identified all of your potential food allergies. The reason that “foreign” proteins make their way into the body and subsequently cause the immune response is because there isn’t enough acid in the stomach to properly break down the food. A lack of something like hydrochloric acid can compromise the digestive capabilities of the body. Therefore, increasing the amount of acid you have in your stomach is essential to eliminating food allergies. Betaine hydrochloride is an easy to find supplement at many health food stores that can be taken before and after meals to increase and maintain a healthy level of acid in the stomach. Bananas, with their wealth of beneficial nutrients, are very good for reducing the symptoms of allergic reactions to food. Bananas reduce skin rashes and stomach discomfort and helps to regulate the body’s metabolism. Therefore, eating enough bananas doesn’t cure food allergies, but it does reduce the severity or likelihood of allergic reactions being too serious. 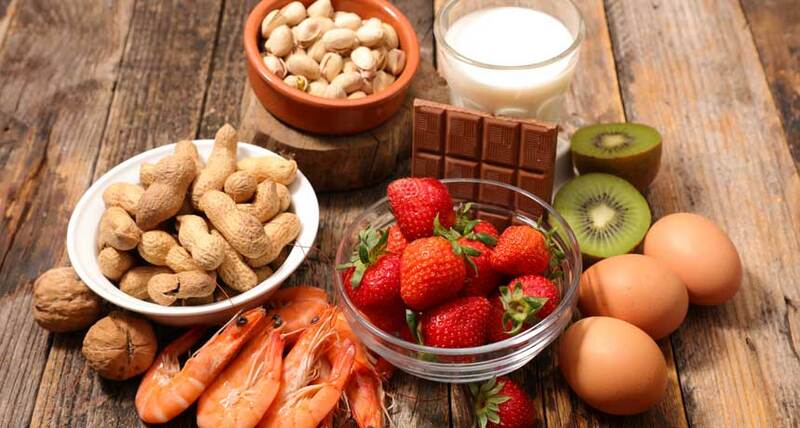 Since food allergies occur because of an inability to break down proteins in the stomach, adding substances that can break down proteins and help them move unnoticed through the digestive system is also a good tactic for preventing food allergies. Activated charcoal can be mixed with water or a sweetened juice solution can be used and regulates the digestive system. You will need a decent amount, possibly 60 grams to be effective. A deficiency in the immune system is often to blame for the food allergy, since a malfunction in that all-important defense system might make it react incorrectly to certain proteins. Improving the health of the immune system is most effectively done by flooding your system with vitamin C and other beneficial vitamins and minerals that fruits and vegetables provide. However, that being said, make sure that you aren’t allergic to any of the fruits and vegetables your are boosting your system with, as that can be counterproductive to the entire process. This has long been known as a solution for improving the strength and resistance of the stomach to various food items. Castor oil coats your stomach and reduces severe effects of any allergic reaction to the food you eat. Drinking a small amount of castor oil (a cup of water with 5-10 drops of castor oil) every morning on an empty stomach. Vitamin E is known to be very anti-allergenic and it can boost your body‘s immune system strength, so it doesn’t falsely recognize acceptable proteins as dangerous “foreign” substances. Some foods that are rich in vitamin E include tofu, spinach, almonds, sunflower seeds, avocados, shrimp, rainbow trout, olive oil, and broccoli. Similar to foods like bananas, flaxseed oil is very effective at boosting the anti-allergenic behavior of the body. It affects the immune system and improves the tolerance of the body’s systems to a wide variety of proteins and food items. Pantothenic acid is another very important elements in anti-allergenic activity, but it is also known by another name, vitamin B5. Some of the best foods for vitamin B5 include mushrooms, oily fish (trout), cheese, eggs, avocados, beef, veal, pork, chicken, and sweet potatoes. It is another citrus fruit, as mentioned earlier, but lime juice, when added to water with some honey, can work as a powerful detoxifying substance in the body. If you drink this mixture for a few weeks, it can flush the toxins from your system. These are the sorts of toxins that can confuse your body’s immune system and cause these issues with your protein digestion. Alternative healing has been used for countless health conditions over the years, and all over the world. Acupuncture is a very good way to restore the natural balance of the body, as well as the metabolic functions and immune system responses. The best part of using acupuncture is that there are no side effects, and you will be able to help dozens of other potential medical conditions as well. Using a trained acupuncturist, particularly one who is specifically knowledgeable about food allergies, is always recommended for the best results. Various asanas from yoga have been directly linked to reducing allergic reactions in the body, and the particular sensitivity of overly delicate stomachs. As with acupuncture, using a trained yoga instructor is often a better choice than trying to do them on your own, at least at first. This mixture is a very effective treatment for food allergies, especially during a breakout. Anti-allergenic components in both of these vegetable juices make this a smart choice for your food allergy issues. While these home remedies can help with your problems, food allergies can be extremely severe, and even fatal. You should speak with an allergist so you can get all of the information about your condition. Depending on the severity of the allergy, avoiding the food altogether is probably the wisest choice. As always, prevention is better than treatment.